I was born on a farm cradled by mountains in the Aliwal North district of the Eastern Cape. My father Kobus Kotze is a well-known landscape artist. The hours I spent painting with him in his art studio opened my mind to art. My mother Joe Kotze only started painting later in her life. She coloured my life with stories and made me aware of all the beauty around me. 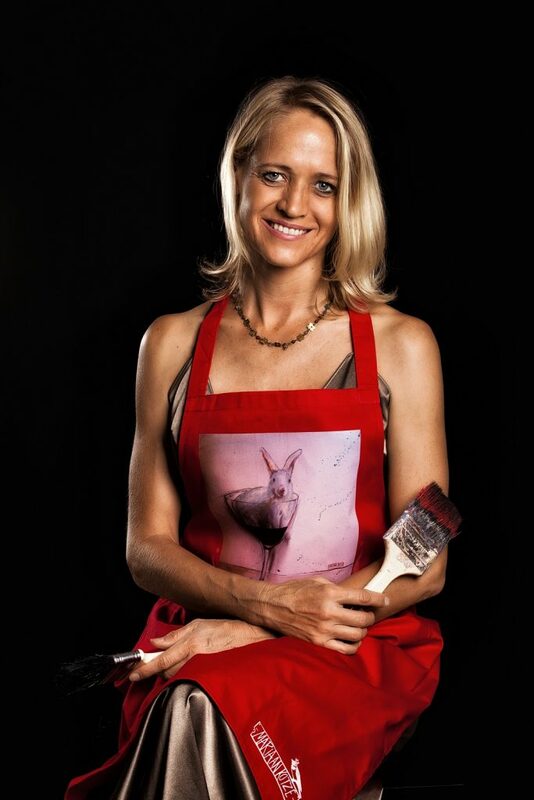 Hanlie Kotze my sister is a well-established artist. My brother Floris Kotze and his wife are the owners of the respected Kotze Art gallery in Bloemfontein. I received my art diploma from the Free State Technicon in 1990, majoring in sculpture. After my studies I were always in some or other way engaged with art. I have been balancing the act of being an artist and a mom of three beautiful daughters. I am full-time artist since 2002, however it is only in recent years that I struck out in a fresh direction; moving beyond my usual boundaries. Stories and elements of inspiration accumulated in me over years. These stories are impatiently waiting to be conveyed into art pieces; bit by bit, as they emerge into narratives covering canvases and even spilling over onto and into other functional objects. I urge to explore and experiment; I delve deep inside while I create. I escape into a zone I only get to enter while working, unravelling stories, bursting out of my subconscious. I can relate to the theory that people have a collective memory, symbols emerging out of that memory, a memory going further back than my own conscious. My approach keeps taking numerous detours. I am on a constant journey, experiencing a deep connection with the piece I am working on, with my burning passion for art, being behind my easel is the place I feel save. I transform abandoned objects and vintage furniture into pieces of art. Each object has its own personality and theme. I incorporate the imperfections of the furniture to become spontaneous elements in the paintings covering the items. My art found its’ way to boardrooms, waiting rooms and private and corporate collections across the world. I seldom plan any artwork; preferring to start with an element and allowing it to evolve into a narrative with a feeling rather than a message. My restless nature keep steering me in new directions, passionately exploring new themes and objects to work with. Inspiration from a word or song can trigger my creativity into an idea or concept for an artwork. Although my work is packed with symbolism, most of it is not planned or thought through. Sparrows: It features in my logo and is symbol of loyalty. It is small yet powerful and humble. Birds, Wings and Feathers: Are symbolic of freedom, hope, communication, new beginnings and a reminder to pay attention. Circles: Unity, completion, wholeness, timelessness. I recently started the development of a few product ranges featuring my art. It makes my favourite creations accessible to a wider market via functional art, branded utilitarian gifts and décor items . If any of these images on these product ranges appeal to you, an original artwork can be commissioned. Although I will never replicate a work previously done, I will gladly do something in a similar fashion; a personalised commission, portrayed with elements of what you love, synergised in the composition of the artwork. It could be a painting for your home or workplace, depicting your favorite books, paraphernalia or a few possessions that are special to you. Feel free to contact me for any commissions. You need too know no more. Behind my easel is the place where my soul rest. It is there that stories emerges . Where canvasses get covered in narratives . I am not just passing through . Learning. Growing. Searching. My art is an ongoing evolution. One promise: A promise that my art will get better, year after year. Look at my creations...Be still...Listen...They will do the talking..."